A standard leachfield is a series of underground trenches filled with stone or gravel and covered with soil. This secondary treatment device provides a medium for further treatment of wastewater. Distribution Box: A distribution box divides the effluent flow from the septic tank and directs it to one of several leaching lines. 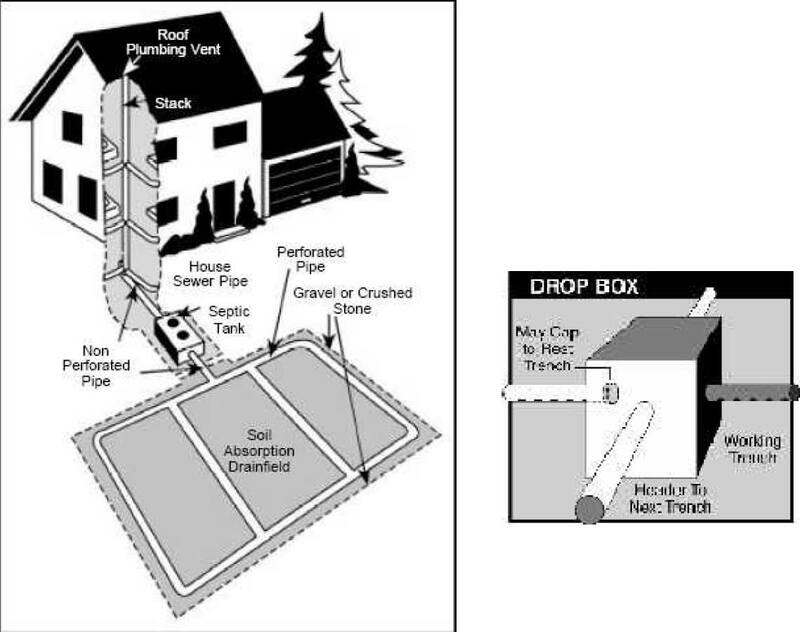 Drop Box: A drop box is a special distribution box designed to maximize the use of each leaching trench. Trenches: Perforated pipes located in the trenches distribute wastewater into the soil. The gravel and soil in the trenches act as biological filters. Soil: As the wastewater percolates (moves through the soil) to the groundwater below, the filtration process and organisms in the soil work to remove toxins, bacteria, viruses, and other pollutants from the wastewater. Soil particles, particularly clay, chemically attract and hold sewage nutrients, metals and disease carrying organisms. Lids: Make sure all lids (septic tank, distribution/drop box) are accessible. Tank lids should be extended 4-6 inches above grade. Check lids for cracks that allow water to enter the system or prevent Health District personnel from performing routine inspections. Lids that cannot be moved without cracking or falling apart must be replaced. Money – Poor maintenance is a common cause of early system failure. The minimal amount of preventive maintenance a septic system requires costs very little compared to the cost of repair and replacement. Health – When a septic system fails, inadequately treated household wastewater is released into the environment. Direct contact with poorly treated human waste can pose significant health risks. Untreated wastewater can also contaminate nearby ground and surface water. Economic Health of Community – Failed septic systems lower property values and contribute to the pollution of local rivers, lakes, and ponds used for commercial or recreational activities. Protect your septic system from potential damage. Only plant grass near your septic system – roots from shrubs and trees can cause damage. Don’t allow heavy machinery over any part of the system. Never build anything over the drainfield. All contracted repairs must be performed by registered professionals. A list of registered pumpers and contractors is available on the Health District’s Web site, www.hamiltoncountyhealth.org, or by call 513/946-7966. Permission granted by The National Small Flows Clearinghouse, Pipeline Newsletter. For more information, please call the Water Quality Division at 513.946.7966.